Baden is located approximately 25 km in the south of Vienna. 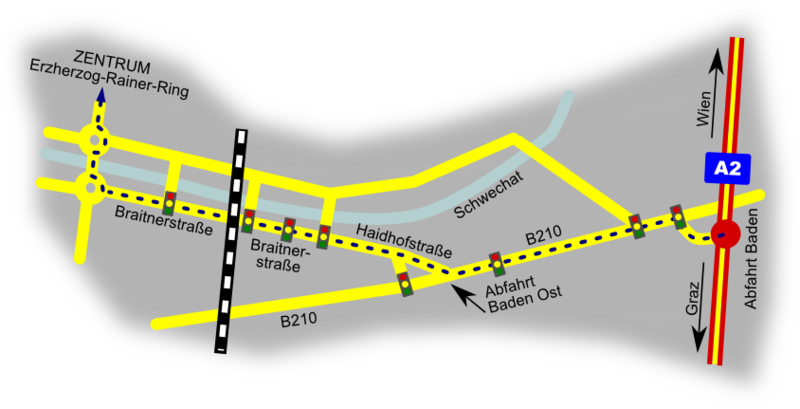 You can get to the exit Baden from both directions of the A2 highway. Turn to the left at the 1st traffic light onto the main road B210. After approximately 1,5 km take the exit Baden from the B210 to Haidhofstraße. After approximately 400 m Haidhofstraße changes into Braitnerstraße. Proceed on this road until you reach the roundabout after approximately 1,5 km. Take the first exit of the roundabout onto Kaiser the Franz Joseph bridge. After the bridge you reach the next roundabout. Take there the 2nd exit to reach Erzherzog Rainer-Ring which is already in the town center of Baden. Please use the town center map for further orientation.